Our lives won't be complete until Keane does reality tv. THERE WAS A funny story doing the rounds last week about Roy Keane being asked by various reality tv producers to take part in their shows. This quote from Keane basically sums up his attitude on that form of entertainment. ‘I met the jungle people, but I thought, ‘Nah, not for me’. The ‘jungle people’ are presumably from I’m A Celebrity Get Me Out Of Here and while Keane might not be too enthusiastic about getting involved we couldn’t help but imagine how great it would be were he to participate in any reality show. Here are ten shows that would be appointment viewing if Keane was involved. Roy Keane and Gordon Ramsay constantly in each others faces? Yes please. Given Ramsay’s feisty demeanour and his Rangers connections, I reckon that punches would be thrown in episode one. Just have a look at Ramsay here (warning: a lot of NSFW language is used) and try not to notice the similarities between his behaviour and Roy Keane scorching the earth towards the end of his Old Trafford tenure. Most likely outcome: Keane stabs Ramsay with a carving knife before the first ad break. It would be great to see Roy Keane working away on the usual team tasks like coming up with a new name for a chocolate bar. A pity Bill Cullen’s version isn’t around anymore so we can’t see Cullen say Keane is ‘spoofing’ but watching Roy Keane getting fired by Alan Sugar would be… well, there would be even more expletives than that Ramsay video. As we know, Roy Keane doesn’t take kindly to being fired by anyone. Most likely outcome: Keane gets fired in a highly charged boardroom showdown before railing against the ‘lies’ told about him in the boardroom during the traditional post-firing car journey. Keane always says how proud he is to be from Cork and were he to be in charge of one of his local teams for this show it’s likely that the passion coursing through him would make his voice only audible to dogs. Seeing Keane going up against some b-list celebrity coaching some Dublin team would surely make RTE revive this programme. Most likely outcome: Keane gets his side to the final but walks out on the morning of the game after disagreements with club officials over the location of the post-match banquet. They go on to win but Keane says the victory means nothing to him now. Roy Keane cooking for some c-list celebs would be good enough, but you would also have him eviscerating some daytime television host or a former lingerie model over desert. Keane proved last week how tough of a film critic he could be, so getting him to judge the meals of all the other people on the show would be high comedy. Most likely outcome: Keane’s reviews of the other dishes get nastier and nastier until he’s mysteriously poisoned at the final meal, possibly by a rogue soufflé. He might not have the business acumen of most Dragons but then again, half of them have gone bankrupt anyway and Keane has made a lot of money over his career. Can you imagine someone coming in with an idea like this and then Keane just staring at them in silence for two minutes straight before a terse, ‘I’m out’? Most likely outcome: Keane goes a whole season without investing once. The closest he comes is a 50% scowl followed by, ‘nah, not for me’. 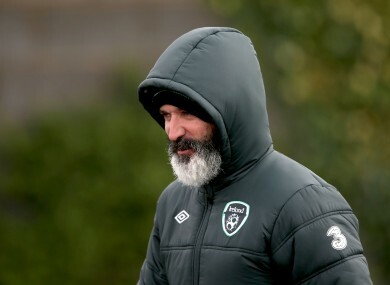 Roy Keane being forced to live with some pop star or even better, an ex-Big Brother contestant, would give us a great chance to see what Keane is like at home as well as the comedy of seeing his increasing dismay as wholesale changes are implemented in his house. This show didn’t quite give Ron Atkinson the career bump he had been hoping for so Keane wouldn’t be in the best company when it comes to former footballers who have made an appearance. Most likely outcome: Probably something along the lines of what would happen on Hell’s Kitchen. We basically treat Roy Keane like Simon Cowell as it is, soliciting his opinions on different topics just so we can hear his cutting critiques. There would definitely be some cute singing and dancing eight year old who Keane would scar for life after berating them. The housemates in the last series included Audley Harrison, Kellie Maloney (formerly known as Frank), Ricci from Geordie Shore and Gary Busey. Keane’s interactions with all the washed up celebs would be brilliant but he would likely be up for eviction every week. The public wouldn’t get rid of him though and he’d probably end up winning the whole thing. Most likely outcome: Keane makes the finally two, but after an unnecessary punishment for failing to follow the strict rules of a task, this happens. What reality show would you like to see Roy Keane on? Do you agree with our LOI Team of the Year? Email “Keane vs Ramsey and a boardroom showdown: 8 reality shows that need Roy Keane”. Feedback on “Keane vs Ramsey and a boardroom showdown: 8 reality shows that need Roy Keane”.